One of the more frustrating aspects of doing home woodworking projects comes from a mismatched joint where the wood isn’t seamlessly joined together. It speaks at once to a poor joint, frustrates the woodworker and immediately draws the eye to the imperfection. 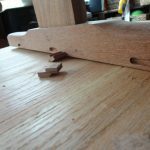 While the best way to fix seams and gaps in your woodworking is not having them in the first place, everyone who makes furniture runs into this situation at some point. However, there are three common fixes for seams or gaps that occur in wood during assembly: glue and sawdust (which includes epoxy/sawdust mixtures), a dedicated commercially available wood filler and using a small sliver of the actual wood. For the most part, if the seam is small (< 2mm, 1/16th of an inch) or in an out of the way location, using a mixture of sawdust and glue should not only cover the seam, but if the ratio of glue/sawdust is proper, then the resulting finish should hide the open seam very well. Some woodworkers don’t care to use this filler method as it often results in the filler being much darker than the surrounding wood once the finish is applied. This darkening of the finish comes from the tremendous amount of surface area associated with sawdust “flour” generated from table saws and other machines (routers, bandsaws, etc.). However, if your sawdust also includes shavings or larger diameter dust, you can create a dust/glue mixture that won’t absorb as much of the stain/finish and the resulting applied finish won’t be as pronounced (translation: darker than the surrounding wood) and your results will look much better as the lowered surface area of the shavings/larger dust lowers the amount of stain absorbed by the repair mixture. If your dust only includes the ‘flour’ type of sawdust created by tablesaws, then mixing this flour with items that don’t absorb stain (chalk—calcium carbonate or gypsum from drywall) can improve the absorption characteristics of the mixture. Also, adding a little extra glue to this mixture also reduces the amount of stain the filling absorbs. Glue doesn’t take stain, as any woodworker knows since we’ve ALL made the mistake of not wiping away all of the glue during a glueup only to witness the horror of a section of your project that doesn’t take any color whatsoever because of that excess glue. The same series of steps also apply to fixing an open seam with dedicated wood filler. Available in a variety of styles and colors, wood fillers offer an attractive alternative to the approach of trying to create your own flour paste to fill your gaps. Many woodworking supply companies carry these wood fillers in many of the common hardwood species (native to the US). These fillers are made from real sawdust from the species on the label, and a can of this material (6 oz., 170 g) runs about $6 USD (~€5). 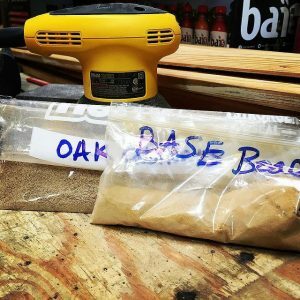 These products take some of the guesswork out of trying to make your own wood filler, but unless you have a cabinet of each color or purchased a can prior to beginning your project, it grinds your project to a halt as you head to the home-center or (worse) you wait for it to come in the mail. The last and perhaps most effective method of fixing small gaps in wood is actually using a piece of the wood from the project itself as the wood filler. The benefits of this approach are obvious; the wood absorbs stain/finish the same way the rest of the project does, it can look seamless if done correctly and it doesn’t have to stop your progress completely. Fixes of this sort would apply to a table top with a gap/seam of 1-5 mm (up to ~3/16th of an inch) or a tenon shoulder that doesn’t meet perfectly with its mortise housing (gaps of 1-2 mm only). On a table top, using a trim router or a scratch stock, create a seam that’s deliberately a little larger than the seam gap. Make the width consistent and scratch out a depth of ~ 3 mm (1/8th inch). With the gap now of uniform size, size a piece of scrap wood (make sure to pay attention to grain color and patterns) to the size of the new opening. Make the depth of this filler piece slightly thicker than the depth (4-5 mm) and plane off the excess once it’s glued in place and dry. If you were careful with your color and grain selection, the fix should be virtually impossible. For tenon shoulders, carefully plane a thin strip of scrap wood to the size of the tenon gap and insert it. Check the fit before you commit to gluing it up. Once you’re satisfied with the fit, glue it in place and use a sharp chisel to pare away the excess once the glue dries. Again, careful selection of wood for color and grain make this type of repair virtually invisible.